The turnover rate for companies in the construction industry is high. This book identifies the ten key elements of contractor failure and shows how to avoid them. Each element of failure is defined, illustrated by real examples, and ways are discussed to avoid or minimize the risks involved. The final chapter shows how to bring all these elements together to develop a positive and workable management strategy. 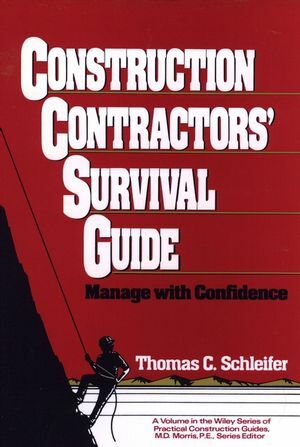 This survival guide should prove invaluable to the 1.4 million individual construction-industry businesses in this country. THOMAS C. SCHLEIFER, Ph.D. has 45 years of industry experience and was founder and President of the largest international consultancy firm serving the contract surety industry. He was an Eminent Scholar and Research Professor at the Del E. Webb School of Construction at Arizona State University. Dr. Schleifer, is known as "a turnaround" expert because of the number of companies that he has rescued from financial distress. Change in Type of Construction. The Use and Misuse of Computers.